The first office, the National Marine Fisheries Service (NMFS) has a mandate to be a manager in all four Marine National Monuments of the Pacific. The second office, the National Ocean Service (NOS) has a mandate to be a manager only in Papahānaumokuākea and Rose Atoll Marine National Monuments which are comprised of National Marine Sanctuaries. 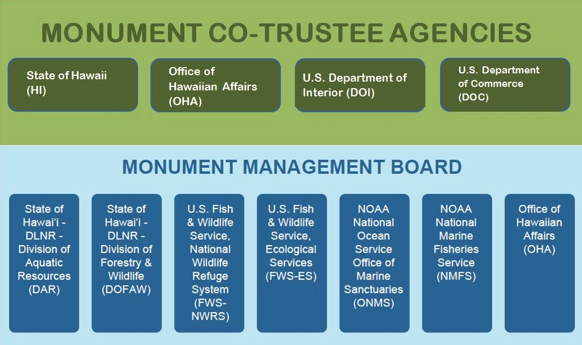 There are two different offices within US Fish and Wildlife Service that have mandates which apply to the activities within Marine National Monuments. The first office, National Wildlife Refuges, actively manages the refuges found within the Monuments. The second office, Ecological Services, provides resources and research for listed endangered species.